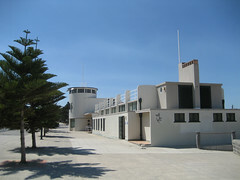 The Beach Dressing Pavillion on the Esplanade in Williamstown was built in 1936 and now provides the setting for Sirens Restaurant and Bistro. This building echos the nautical theme almost expected by its seaside location. There is a flagpole near the 'bow', a deck with a metal railing offering magnificent views over the Bay, portholes and a circular 'bridge' at the 'stern'. A great example of a heritage building that has been adapted and reused with a fantastic result. The 1931 earthquake that brought so much destruction to the Hawke's Bay region of New Zealand also created a new suburb. A large area of marshy land near Napier was raised by the quake and became dry land. In the mid to late 1930s, the area was opened up for residential development and became the suburb of Marewa, 'raised from the sea'. A lot of the houses in Marewa were built as single storey modernist buildings. Often rendered and painted white or a pale colour with simple stylised decoration. Low walls were also common, setting the boundary of the property without obscuring the house. The house above has very simple geometric decoration on the corners near the roofline and a fantastic lamp in the front garden styled as a lighthouse. Another house has a stepped roofline but the central section steps down meaning the central section of the house is lower than each side. Often the central section is the highest point of a building. A line just below the roofline with a stepped kink at the corners is just about the only decoration although it does continue around the side of the house. The window sills have been painted to match this line creating a nice effect. The colour is also included around the base of the building effectively grounding the house on its lot. The house shown below is my favourite. It is a handsome building with a curved central section at the front with other rooms within the house stepped back retaining their rectangular shape. A series of simple, triangle based, elements provide the house with its decorative signature. The door is recessed into a deep porch and the steps in front of the door, although not visible in my photo, sit out from the front of the house taking up half the width of the path leading from the driveway. The owners have done a fantastic job with this house right down to the topiary near the mailbox and marking the path to the front door. When you go to Napier make sure you set aside enough time to have a leisurely stroll through the art deco suburb of Marewa. 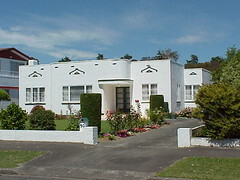 The city of Napier, on New Zealand's North Island, is a deco lovers delight. 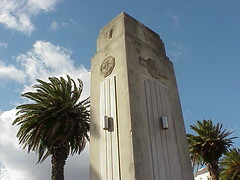 Most of the town was destroyed by an earthquake in 1931 and the subsequent rebuilding program was mostly completed in Art Deco style. 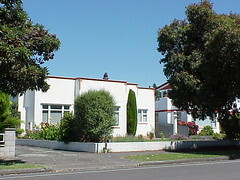 Masson House was designed by E A Williams in 1931. 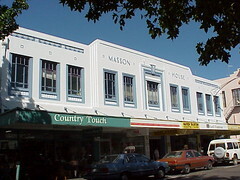 It is a simple elegant two storey building with row of shopfronts at street level. The upper level has a series of windows with plain, almost old-fashioned decoration. Certainly the central window, which has the most decoration appears to have come from an earlier period. The central section of the facade sits higher than the symetrical wings. Where these two elements join, there are three steps down in height but also three steps back from the street. 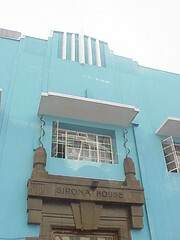 The most deco elements are the relief panels on each wing with a geometric wave pattern and the name of the building on the central section in lovely stylised lettering. Yesterday I wrote about the most beautiful McDonald's in the world so today I thought I would show you the second most beautiful. 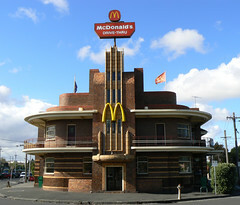 It is in Taradale, New Zealand and it is one of only two Art Deco McDonald's that I know of. Like Clifton Hill, it was originally a pub, the Taradale Hotel. The hotel originally openned in 1869 as the Duke of Edinburgh but was destroyed by fire in 1904. 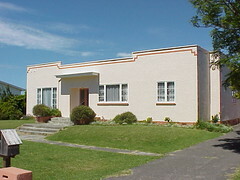 Rebuilt, it suffered a worse fate in the 1931 earthquake which devastated the Hawke's Bay area. Like many buildings in nearby Napier and Hastings, the pub was again rebuilt, this time in the style of the times, Art Deco. 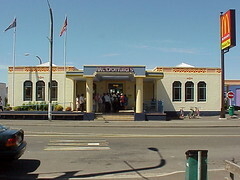 In 1997, McDonald's were persuaded by the Art Deco Trust to retain the building and convert it to a restaurant rather than demolish it. 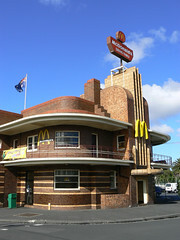 I believe one of the arguments used to persuade McDonald's was the fact that the building is included in Art Deco Napier: Styles of the thirties a very popular book by Peter Shaw & Peter Hallett which has undergone several reprints. Did McDonald's want a picture of the old pub with a caption describing its demise or a picture their new Taradale restaurant. 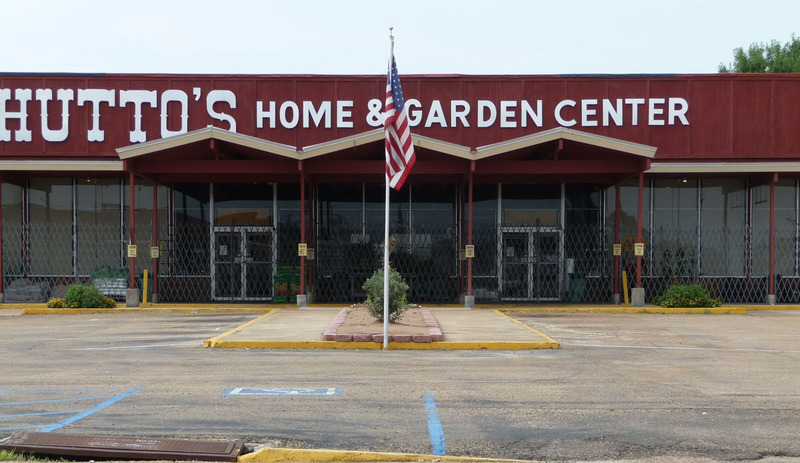 Sometimes the commercial argument is the clincher when trying to preserve and reuse older buildings. 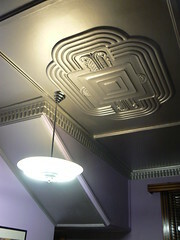 Inside some of the deco features have survived including the cornice and this wonderful ceiling decoration (shown above). The McDonald’s restaurant in Clifton Hill, Melbourne is the most beautiful McDonald’s in the world. Originally the United Kingdom Hotel, it was designed by architect James Hastie Wardrop and constructed 1937-38. It is a spectacular art deco pub consisting of a central stepped fin and curved wings with deep rounded balconies. The windows overlooking the balconies are also curved. Bands of different coloured bricks provide decoration on the ground floor. The original side door on the left has been bricked in and a new door cut into the side wall where there was previously a small window. Whatever you think of McDonald’s, it is fantastic that they were persuaded to keep this wonderful building and it has served as an example to help protect other buildings including the former Taradale Hotel in New Zealand which was also converted to a McDonald’s. 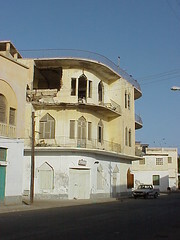 Massawa is a port city on the Red Sea coast of Eritrea. It is hot, dusty and suffered a lot of damage during the Eritrean Struggle with Ethiopia. The architecture reflects a lot of Arab influence but also shows some art deco style. This apartment building shows both. 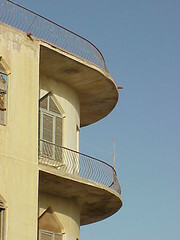 The building curves around two corners with simple metal railings surrounding the balconies and flat roof. The balconies also act as shading for the windows below providing some relief in this harsh climate. I'm not sure if the condition of the top floor is a result of bombing during The Struggle or whether it is being renovated. It is difficult to tell. It doesn't help the general outlook of the building when all the wooden shutters are closed against the heat of the day. The shape of the windows is lovely. The triangles above the standard rectangluar windows an balcony doors add a simple elegance. Even here you'll notice that the original design has been compromised by alterations. In the case of the lower flat, the triangle window has been filled in. At least it is still recessed so the shape can still be seen but it lacks something without the wooden slats. 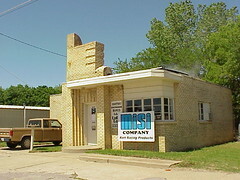 The Misi Company in Tulsa, Oklahoma occupy a modest art deco building away from the downtown area. I like the way all the decoration comes from the way the bricks have been laid. The doorway is stepped back under a fantastic asymetrical pediment. Although it is mostly a large rectangular expanse of brick, there is decoration to provide some interest in the three recessed bands around one side and the curved tops to the columns on both sides. The simple window is set into the corner of the building further breaking the hard lines of the bricks. There is also interest in the circular step in at the door and the curved end to the concrete path in front of the lawn area. It is a shame that there sign is a little too large and just a bit too close to the building but then I suppose they could of stuck it above the door whoch would have been much worse. When I was exploring the Sun Theatre this morning I spent most time taking photos in The Grand. As with most of the other cinemas in the Sun Theatre complex, The Grand is named after a former local cinema and it lives up to its name. 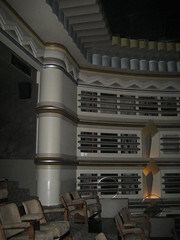 Occupying the original stalls area of The Sun, this cinema has the most original art deco features. 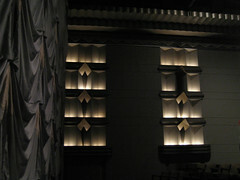 The picture above shows the amazing decorations of the walls near what is now the front of the auditorium. The orientation of the seating has been switched in the Sun’s new configuration as a multi-plex. 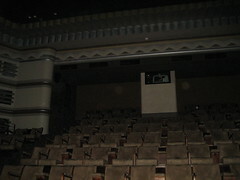 The original proscenium arch is now at the back surrounding the projection box. Even in the rather dark picture above you can see the complexity of the art deco details. This picture shows it off a bit better including the metal ring ‘fence’ which separates the seating from the walls. It is a grand space in many ways. I saw 21 in this cinema last week and almost tripped over my own feet looking back at the decoration rather than concentrating on where I was going. I think that is an acceptable risk for such a beautiful building. I’ve written previously about my favourite cinema, the Sun Theatre in Yarraville. I also wrote that I had the chance to explore the complex without the inconvenience of any audiences in the cinemas. 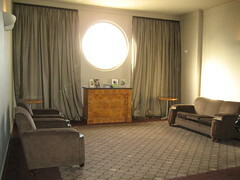 I headed upstairs first of all to the lounge area with its porthole window, period furniture and monogrammed Sun Theatre carpet. The original balcony of the Sun has been converted into The Barkly, named after a former cinema in nearby Footscray. Some of the original decoration has survived on the walls in this area of the building and this was one of the first areas to be restored and re-opened for the screening of films when the owners Michael & Anne Smith formed The Sun Film Society in the mid 1990s. 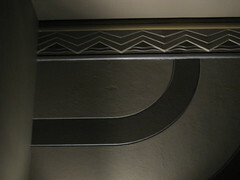 The decoration consists of a cornice made up of a series of deco chevrons. 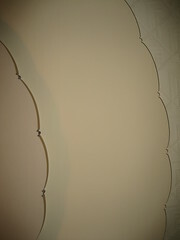 The lower part of the wall features three broad bands which run from the cornice and curve towards the screen. 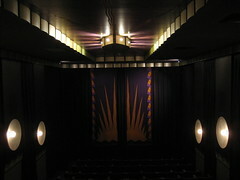 This design is echoed in the curtain made specifically for this cinema. Next door is a small cinema called The Trocadero named after another former Footscray cinema. 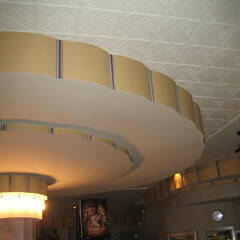 The decoration in this cinema reflects the original features that survived elsewhere in the building. The curtains and central light are fantastic and although I do like to see the original deco features in the Barkly, I am not disappointed when the session is scheduled for this lovely space. I went to the Sun Theatre early this morning, very early for a Sunday anyway. The Art Deco Society had organised a showing of Miss Pettigrew Lives for a Day starting at 10:15 and before that there was morning tea but more importantly, the cinemas were open for us to explore. As I wrote in a previous post, The Sun Theatre is an original Art Deco cinema which opened in 1938 and after falling into disrepair has been refurbished over the past decade and now houses six boutique Art Deco cinemas. As much as possible of the original decoration was saved and restored. The picture above shows an amazing column in the foyer. 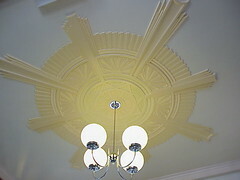 The decoration near the ceiling could be stylised clouds especially when viewed directly from below as seen in the picture on the left. The film was great. Frances McDormand was great in the title role but not surprisingly, my favourite part was spotting the fabulous London Art Deco buildings used as locations. I didn't get the chance to see a lot of Art Deco in the short time I was in Nairobi but I did manage to snap this from the mini-bus as it whisked me through the mental traffic. I can see it is called Sirona House and I know nothing else about it. I don't even know what street it is in but I felt like going a bit exotic for this blog and this is what I found. I love the seriousness of the stonework with the named etched above the door against the shocking blue colour and the simple white 'eyebrows' above the windows. I am intrigued by the black wires snaking up from the stone urns on each side of the window. I assume they are cabling for lights, perhaps even neon but they look almost perfectly symetrical. If is as if that was taken into account to help preserve the beauty of the buildings facade. 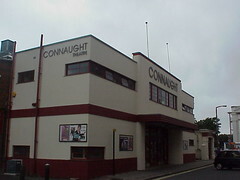 The Connaught Theatre in Worthing, on the south coast of England, is an earlier building that received a deco makeover in the 1930s. According to Cinema Treasures, it was originally built as the Picturedrome in 1914. Designed by Peter Dulvey Stonham with a refurbishment by A T Goldsmith in 1933 which gave the building it's Art Deco facade. 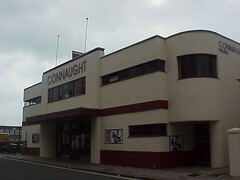 The Picturedrome only remained open for a further 2 years closing in June 1935 but by September that year the Worthing Repertory Company took over the building calling it the Connaught Theatre. The facade is asymetrical. The central entrance with two flagpole on the roofline above the main doors. A narrow horizontal band of windows on the second storey and shorter bands of windows on the lower floor set at different levels. The windows on the left being lower that those on the right. On the right there is a side entrance built into a curved section of the building with a great curved metal framed window. The other end of the building truncated at the end of the rectangular wing. Today, the Connaught Theatre combines films and live shows and will stage a live production of 'Allo 'Allo! in October 2008. It probably does get lamer than that, I just can't think of it at the moment. In 1934 Victoria celebrated the centenary of European settlement in grand style. A royal visit was planned with Prince George representing his father King George V however his engagement to Princess Marina of Greece and Denmark meant that his brother Prince Henry, Duke of Gloucester, came to Australia instead. The Board of the Homoeopathic Hospital, which had been founded in Spring St in 1869 before moving to St Kilda Road in the 1880s, had considered changing the name of the hospital to Prince George's however the change of visiting royal saw it become Prince Henry's. It was demolished sixty years after this change of name in 1994. The Royal Visit led to a lot of concern about where the party would land and how they would be conveyed to Melbourne. St Kilda believed that the Prince should land at their pier and make his way to the City along Melbourne's grand boulevard, St Kilda Road. Port Melbourne argued that their piers were the gateway to Melbourne and it was fitting that the Prince should be landed there. The argument raged back and forth during the early part of 1933 with the foreshore at Port Melbourne considered a dreary wasteland and not beautiful enough to welcome a member of the Royal Family. A grand Centenary Boulevard via Williamstown Road or Beaconsfield Parade was proposed but was abandoned by September 1933 when the Chief Commissioner of Railways, Mr H Clapp, pointed out that a level crossing was inappropriate for the amount of rail traffic accessing Station & Princes Piers at Port Melbourne. As early as 1924, the Melbourne Harbor Trust (MHT) had proposed that Port Melbourne Council (PMC) that they should build a bridge over the pier with all interested parties contributing to the cost. MHT offered to pay half the cost but Council rejected the idea saying it was entirely a matter for the MHT. With the Centenary Boulevard proposal a non-starter, the possibility of a bridge was resurrected and The Record, 23 Dec 1933, reported that 12 designs for a bridge at Port Melbourne had been proposed. The cost would be £60,000 with MHT prepared to meet ⅔ of the cost if the Government found the remaining ⅓ and vested certain land to the MHT. The Record, 17 Feb 1934, reported that 20 men had begun preparations for the new bridge the previous Monday. The following edition reported that 30 men had started work on the western ramp of the bridge itself. In May, the MHT requested PMC to pay for roadworks in connection with Centenary Bridge. Council refused claiming that the MHT had changed the alignment of the road without consultation and therefore it was not Council's responsibility. Things seemed to be looking up in June when an ad in The Record stated 'Make a bee(r) line for The London Hotel right at the foot of the new bridge'. June and July, however, also saw further correspondence between Port Council and the MHT regarding the roadworks with the issue now deadlocked and neither party wishing to take responsibility for the costs. At least one issue had been resolved. In April it was confirmed that Prince Henry would land at Port Melbourne. The Mayor of St Kilda, Cr Burnett gray sending a personal letter of congratulations to PMC. The Prince disembarked from the Sussex at Princes Pier on 18 Oct 1934. A reception by PMC was planned at Stokes Street before he would be driven along Beaconsfield Parade to St Kilda, then up Fitzroy Street and along St Kilda Road to the Melbourne Town Hall. During his time in Melbourne, Prince Henry also opened the newly constructed Shirne of remembrance. He departed on 12 Nov 1934 but not before thousands of people flocked to Port Melbourne to see the warships Sussex, Canberra, Dunedin, Diomede and Augusta over the previous weekend. The saga of Centenary Bridge did not end with the Royal Visit. The roadworks for the approaches to the bridge were not resolved and the eastern ramp sat at a strange angle to the existing road. In March 1935, Cr J P Crichton drew Council's attention to the unsatisfactory state of road on the eastern approach of new bridge and moved that PMC ask MHT to finish the job. In fact it was worse than that. The Railways had got involved soon after the Royal Visit and had closed the approach to the bridge, since it was their land and they required the MHT to meet certain conditions before the bridge could be re-opened. Almost a year after Prince Henry had been driven over Centenary Bridge it was still not open to the public. The Record reported on 12 Oct 1935 that the approach to the bridge was going to be made. After several conferences between PMC and the MHT a compromise had been reached. They would share the estimated costs of £800. Even this is not the end of the story. In February 1936, The Record reported that the road on the western side of the bridge connecting the bridge with Williamstown Road was still blocked. Traffic was routed along Swallow Street which was unsuitable for the volume of cars using the bridge. The City Engineer proposed improvements to Swallow Street to relieve the congestion and the issue disappeared somewhat until later that year. The Record, 5 Dec 1936 reported that the road connecting Williamstown Road with Port Melbourne beach was open, but not officially. It had taken over 2 years from Prince Henry's visit to complete the project due to the wrangling between the Railways, Port Melbourne Council and the Melbourne Harbor Trust. The bridge itself had some art deco feature especially the pylons on the approaches to the bridge, the street lamps and the stairways down the the Port Melbourne railway station and Station Pier. The pylons and lamps included the hexagonal monogram of the MHT. Centenary Bridge may even have been unique in its design. From the air it resembled a large aeroplane with the normal span of the bridge over the railway line forming the 'wings'. The unusual part of the design comes from a third roadway that ran from the apex of the bridge onto Station Pier forming the 'fuselage'. It was an amazing bridge and just about impossible to photograph. You could never get far enough away from it and still have a clear view. You've notice I am using the past tense. Centenary Bridge was demolished in 1991 by the State Government. All that remains is one of the pylons on the eastern approach to Station Pier opposite The London Hotel. Obviously they didn't think something that commemorated the centenary of the State was worth preserving. It will be interesting to see what the people of 2034 think of this as they celebrate the bicentennial. Perhaps as an old man I can tell anyone who is interested what this marvellous bridge was like and pass on what the older Port residents are telling me now about what the area was like when Prince Henry, Duke of Gloucester came to town and caused a bridge to be built in Port Melbourne. When I vist a town I really enjoy exploring the streets just to see what I can find. 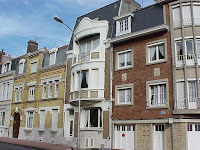 In Calais, I found this apartment. It is not much from a deco point of view but if you look carefully you'll notice there a couple of relief panels in the red brick facade. 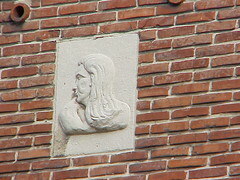 On closer examination they turned out to be a a male head and a female head in an art deco style. I don't know if they were incorporated when the apartment was built or whether they were added later. I'm sorry I can't tell you any more about them. I think it was in a street facing a river or canal but I wouldn't swear on it. I'm just happy I found them. The main sports in Melbourne are cricket in the summer and football in the winter so it is not surprising that the change rooms in Fawkner Park carry panels representing these two sports. What is marvellous for me is that these panels have been done in an art deco style. 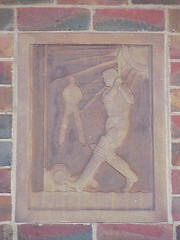 The cricket panel shows a batsman under a blazing Australian sun completing a fabulous shot to the boundary. The fieldsman, with his collar up, hasn't even moved. The footy panel is my favourite. 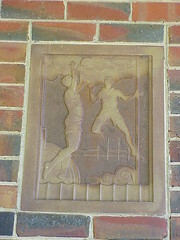 It is rare to see Australian Rules Football represented in deco style and this shows one of the most exciting aspects of the game. Under ominous clouds a player leaps for a high mark while the defender tries to punch the ball away. He almost takes on a ballet pose as he attempts to spoil the mark. Behind him, in the distance, the unmistakable four posts of an Aussie Rules goal. Cricket, footy and deco perhaps there is only one city in the world where this could happen ... sports mad Melbourne. 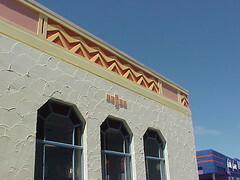 In 1908 TJ West opened the Olympia cinema in a former ice skating rink in Hindley St, Adelaide. For the next 30 or so years it hosted films and vaudeville acts until West decided to rebuild it as a modern cinema using architects Evans, Bruer & Hall in association with Sydney ‘cinema specialists’ Crick & Furse. 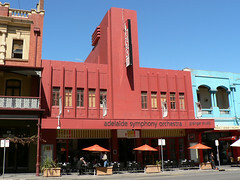 The new cinema opened in December 1939 and now serves as the headquarters for the Adelaide Symphony Orchestra (ASO). The exterior of the building is dominated by a rectangular tower and bears little external decoration. The tower has a series of 4 horizontal bands providing a somewhat aerodynamic look. The windows on the facade are separated by vertical fins showing simple stepped decoration and rounded tops. 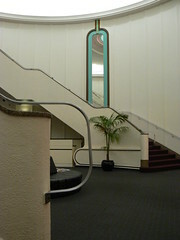 The foyer inside is a wonderful circular space. 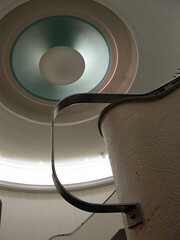 The ceiling has a large round feature with hidden lighting showing off the blue and pink colours. Curving staircases hug the walls leading up to the mezzanine level punctuated by matching mirrors on each side which reach almost from floor to ceiling. 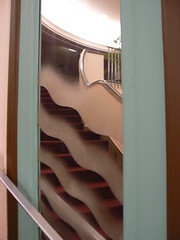 The mirrors are etched with a series of wavy lines that echo the wave of the staircase banister. The ASO run their Tea and Symphony series from the Grainger Studio in this wonderful art deco building. The Bank of Ireland Buildings dominate the view along Royal Avenue in Belfast. It dates from 1928 by architects McDonnell and Dixon. 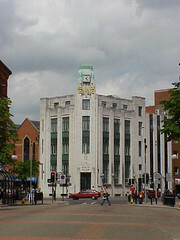 A clock tower with the main entrance to the bank set in the base at street level dominates the corner. The green oxidised copper dome on top goes well with the darker green under the windows and the main doors. Asymmetrical wings stretch out from the tower perhaps to make the best use of an irregular shaped city block. 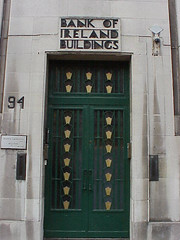 The metal work on main doors to the bank offer a pleasant art deco pattern. Simple rectangles supporting a vertical line of chevrons with a gold coloured piece at the bottom of each one. The design is repeated in the transom window. Above the doorway, the name of the buildings is shown in relief highlighted in black. 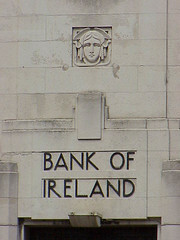 Another doorway along the side of the buildings is identified by the name of the bank shown in relief above it and again, like the main entrance, the name is highlighted in black. 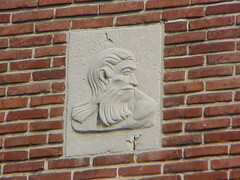 Further above the name of the bank, a relief of a stylised face provides further decoration. The Belfast Daily Photo featured this building in September 2007 indicating that it was empty at that time and worried about its future. I add my concern and hope that a suitable use can be found for this gem. 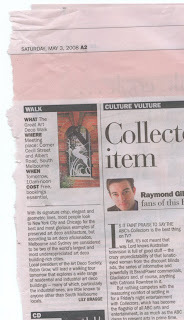 One of my photos was published in The Age newspaper last Saturday. It was the size of a postage stamp but it was still give me a quite thrill to see it. It wasn't credited because it wasn't that sort of item. 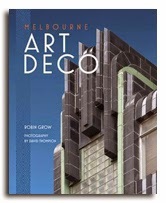 It was a promo for an Art Deco walk in South Melbourne organised by the Art Deco Society and the local Port Phillip Council. The walk was very popular with over 70 people attending so while it is a bit too many for a walk it does show the popularity art deco is gaining. Of course it could be that it was reasonable autumn weather and there wasn't much else to do on a boring Melbourne Sunday. I prefer to believe the former. Getting back to the picture. 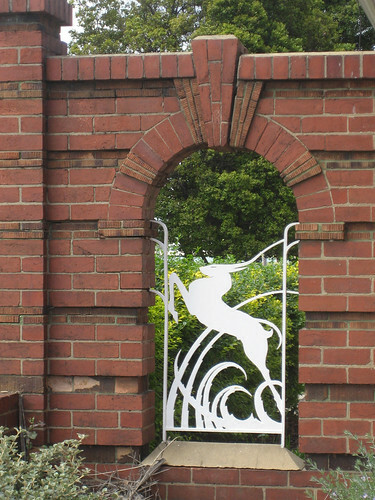 It shows a beautiful antelope which is part of the fence at the former Army Band Building in Albert Park. It is pure deco and an ideal way to promote the walk. I was happy to send one of my photos with the press release and even more happy when they printed it. Electricity came to Port Melbourne around 1911 and the local council set up their own Electricity Supply Department. Even when the State Electricity Commission (SEC) ran most of Victoria's supply, Port Melbourne along with several other inner-city municipalities continued to run their own departments until the early 1990s when the statewide Electricity supply was privatised. 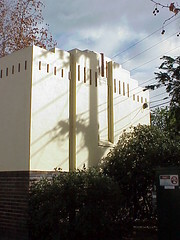 The result is that Port Melbourne has a couple of little electricity sub-stations dotted among the residential streets. This one is at the apex of Nott and Princes Streets behind the Bowling Club. The decoration simple but stylish. The bottom part of the structure shows thin brown bricks while the top has been rendered and painted a nice cream colour. The roofline is stepped and a spaced row of bricks have been embedded in the render. The facade itself is also stepped. Two symetrical columns protrude from the wall with four double-height bricks as decoration on each. The central section is set back from the columns and is topped with another configuration of vertically placed bricks. This simple building demonstates to me how even purely functional buildings were built to be pleasing to the eye. 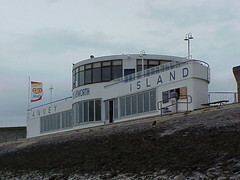 The Labworth Cafe on Canvey Island is a wonderful modernist concrete building overlooking the Thames. With a large round central section, 2 storeys tall, and symmetrical wings supporting rooftop terraces surrounded by simple metal railings, it resembles the bridge of a ship. The building was designed by engineer Ove Arup in 1932, one of his few architectural projects. Arup, the son of Danish parents, was born in Newcastle upon Tyne. He studied and worked in England and Denmark before settling to London. In 1934 he was structural consultant to Tecton for Berthold Lubetkin’s Penguin Pool at London Zoo. In 1946 he formed Arup & Partners and later worked as design engineer for the Sydney Opera House from 1957-1973. Although he died in 1988, the company he founded is still active in international construction projects including the main stadium for the 2008 Beijing Olympics. 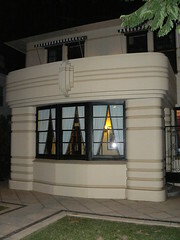 On my recent visit to Adelaide I was lucky to be invited to this amazing Art Deco house. This photo shows the large porch area at the front of the house. It is certainly a very striking feature and provides a large balcony area from the upstairs rooms. It was designed by architect Chris Smith as his personal residence and he operated his architecture business out of offices above the garage at the rear of the property. 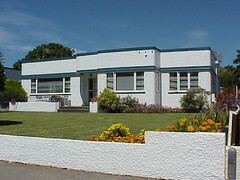 Chris Smith designed many Art Deco buildings around Adelaide including The Capri Theatre in Goodwood Road, Everard Court Apartments on Anzac Highway and City of Holdfast Bay Council Chambers. Inside the features are more or less intact although they have been renovated in recent years. Many of the rooms have built-in furniture and ornate decoration on the ceilings and cornices. Some of the decoration is a bit over the top (in a good way) as if Smith was showing off some of his cinema designs to prospective clients but the etched glass doors leading to the dining room are very simple, elegant and almost impossible to photograph. The ceilings have been painted silver or a bronze-gold colour and for some reason the light fixtures have been placed where they are needed rather than in the centre of the ceiling decoration as us mere mortals would expect. For instance the kitchen light (above left) is over the built-in banquette seating area rather than the centre of the room. I think it looks a bit weird, here particularly, but worked quite well in one of the bedrooms where the man light was over the dressing table with additional light coming from a wall fixture above the bed. 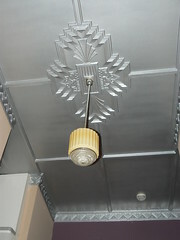 It does allow us to take in all the beautiful Art Deco detail of the ceiling decoration. One area where the function and design came together as I would have expected was in the landing at the top of the stairs (above right) where the light fitting is centred. I think it works really well but maybe I am a bit old-fashioned. 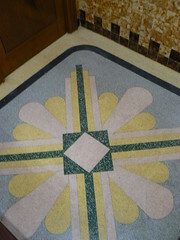 The house also had its fair share of terrazzo. The entrance porches but front and rear had beautiful terrazzo floors. The small area at the back door had a design which may have been just a geometric pattern but could also be interpreted as Chris Smith’s initials. The bathroom upstairs also has a colourful terrazzo floor (left) which the owners showed with a dramatic pause before throwing open the dark wooden door. It certainly had the desired effect. 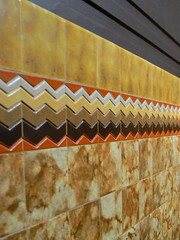 Perhaps in an effort to outdo the floor, the line of tiles halfway up the wall provide an amazing zig-zag of colours. The total effect is mind-blowing. 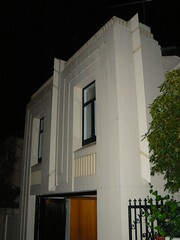 The garage and office (now a self-contained apartment) front onto a side street and have a wonderful deco facade. A central fin, the obvious feature matched with similar fins on the side walls set a little way back from the street-front. It was also great to see the by-fold wooden doors retained in the garage when so often they are replaced with a modern roller-door. I hope next time I’m in Adelaide I get to spend a bit more time in this wonderful house.